As many of you know, I manage the tasting room/bistro Vihuela, which is located in downtown Paso Robles (see the Media page for a press clipping about it!). In addition to being a tasting room, cheese shop, and bistro, we are also the North County pick-up spot for the Cal Poly Organic Farm CSA program! We are lucky enough to be able to use their delicious produce to make some of our menu items…including the soups we have been offering all winter! To be honest, I didn’t even think I liked butternut squash soup or bisque, but I started making it because I knew it would be well-received. The versions I had tried in the past were always too heavy and rich. After trying a few different things, I decided this way of making the bisque is my favorite – it’s surprisingly light and fresh, and I grew to love it. 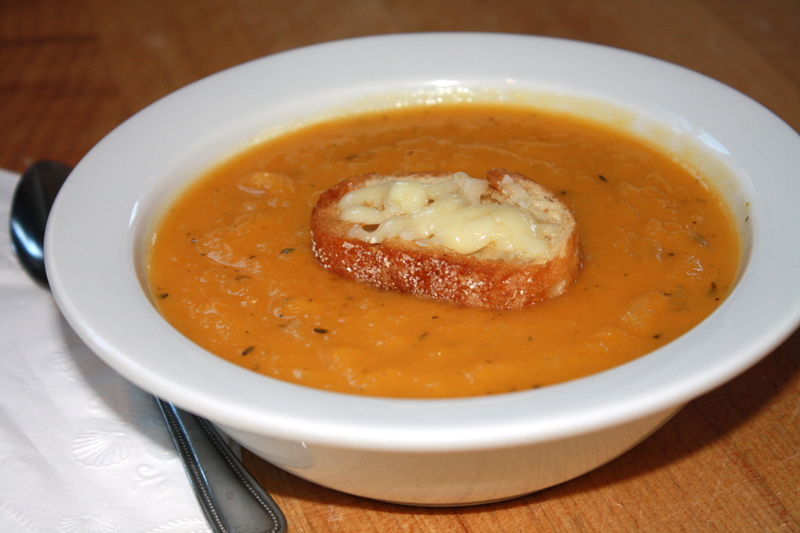 All of our customers raved about this dish, it definitely became our most popular soup! So warming for winter! Enjoy!